In Fall 2018, Community Action Gateway students partnered with local organizations to create one-minute videos that the organizations can use to promote their work. This process gave students an opportunity to learn more about how their partner is creating social change in the city of Hartford. Moral Monday CT is a group devoted to social justice and civil rights work across Connecticut, and Joe Celio ‘21, Pranay Peddinti ‘21, and Tiana Starks ‘21 interviewed Bishop John Selders and other leaders for this video that shares their goals and methods for fostering change. KNOX uses horticulture as a way to engage with the city of Hartford, using urban farming, workforce development, and city beautification programs to create change. Sam Houle ‘21, Divina Lama ‘21, and Mateo Vazquez ‘21 created a promotional video that KNOX has since featured on their facebook page and in donation campaigns. HartBeat Ensemble creates theater that tells local stories and delves into social injustice in Hartford, and through their Youth Play Institute, they teach teenagers from across the Hartford region how to create theater for social change. Eleanor Faraguna ‘21, Sam McCarthy ’21, and Charlene Taylor ’21 focused their video on YPI to promote the program as it recruits its next group of student interns. 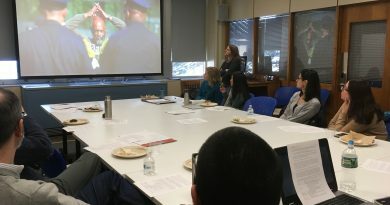 My Classroom to My Colleague is a partnership between Connecticut Center for a New Economy and the Hartford Federation of Teachers that is dedicated to supporting racial equity among Hartford public school teachers. Aidan Arnold ‘21, Amanda Hausmann ’21, and Kevin James, Jr. ’21 interviewed local teachers and students for this video, showing why this movement matters. Achieve Hartford aims to build a stronger city by bringing together local community and business leaders to advocate for better schools. Kevin James, Jr. ’21, Giovanni Jones ’21, and Olivia Painchaud ’21 created a video that shares Achieve Hartford’s central goals with a wider audience. For more information on the Community Action Gateway, please see our website, or contact Gateway Coordinator Megan Hartline.